I was in for a treat when my siblings visited this week. 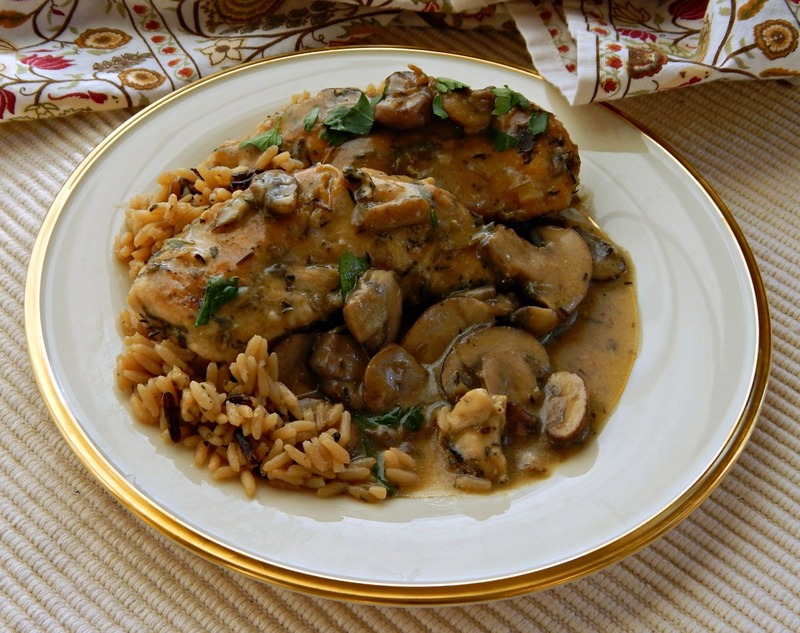 My sister and I found a recipe for Three Herb Chicken with Mushrooms in a little booklet called “Our Best Recipes” by Better Homes and Gardens. A bit of riffing was done on the recipe and we came up with a fantastic, quick cooking variation. Simple to make on the stove top, done in about 20 minutes, and just fancy enough to be called “elegant,” I can see this becoming a staple at our house. I love recipes like this that make you look all “gourmet” and don’t take much more than a little effort and a bottle of wine. 🙂 Well, the fresh parsley helps, too, although not strictly necessary! We served this with a tomato salad, baked sweet potatoes and a wild rice mix, although this would have been lovely over mashed potatoes or pasta, too. It was, indeed, fabulously frugal (a small amount of chicken can stretch to feed a lot of people) and had a lighter, springy feel which is very welcome this time of year. Season chicken on both sides with salt, pepper, 1/2 the rosemary, and 1/2 the thyme. Heat the olive oil over medium heat in a 12-inch skillet. Add chicken to the hot oil and cook for 3 to 5 to minutes until browned on one side. Turn over and brown the other side. Remove from skillet to a plate and cover. Add mushrooms to skillet and turn heat to medium-high; cook stirring occasionally for 4 minutes. Add garlic and cook for an additional minute or so, stirring once or twice. Add flour to skillet, stirring to coat. Stir in chicken broth, wine, and mustard. Cook and stir until it comes to a good simmer. Add the chicken back in (and remaining dried herbs if using dried) and continue to cook until chicken is cooked through and sauce is slightly thickened. Remove skillet from heat. If using fresh herbs, add the remaining rosemary and thyme at this point. Serve mushrooms and sauce over chicken. Sprinkle with fresh parsley. If the sauce has not thickened to your liking when the chicken is done, remove chicken to the serving platter and continue to simmer the sauce, reducing to desired consistency. The sauce should be on the light side, with just a little body. You know I’ll be bringing this to our Throwback Thursday #29 Link Party, hosted by Quinn of Dad What’s for Dinner, Meaghan of 4 Sons are Us, Alli of Tornadough, Carlee from Cooking with Carlee and Moi! That’s right – me! I will also be bringing this over to Angie’s Link Party, Fiesta Friday # 110, Hosted this week by Jhuls @ The Not So Creative Cook and Apsara @ Eating Well Diary, as well as to Freedom Fridays, Weekend Potluck, & What’s Cooking Wednesdays. This entry was posted in Click here for Bargain Meals, Click here for Fabulous Food Posts and tagged Bargain Meal of the Week, Better Homes & Gardens, Chicken, Easy Recipe, Frugal Hausfrau, mushrooms, Wine. Bookmark the permalink. That looks great! We love mushrooms and chicken, so this would be a hit at our house! I love the idea of serving it with mashed potatoes, that sounds so good right now. If it wasn’t my bed time, I would be tempted to whip some up now! My pleasure Jhuls! and Happy FF! This dish sounds really special and delicious. So sweet that you made it with your sister. I would love to do this with my brother, but I don’t think he would want to cook with me. LOL! Lol! It was fun to be Sous chef – she’s a great cook! I know what I’m making this week! What a lovely, simple recipe that my hubby would love. He just adores mushrooms! Thank you for sharing it! Thanks Kathryn – me, too. I love recipes like this – they’re kind of “cheats” in a way. Recipes that are really pretty darned easy but masquerade around looking (and tasting) all gourmet!